I have accumulated a few questions. I have installed vim-like management keymap. 1. When switching to a different file, cuscor goes to the top of the file. How to make the cursor remained at the old place? 2. Do not work import packages of the virtual environment. determined only by Django. Packages installed in a virtual environment! 1. Looks like this bug http://youtrack.jetbrains.com/issue/VIM-419. Could you put a comment about your example there? 2. Make sure that your code runs well and that tastypie is listed in both Settings|Project interpreter|Python interpreters|<your venv>|Packages and in the output of pip freeze in the command line with your virtual environment activated. 3. 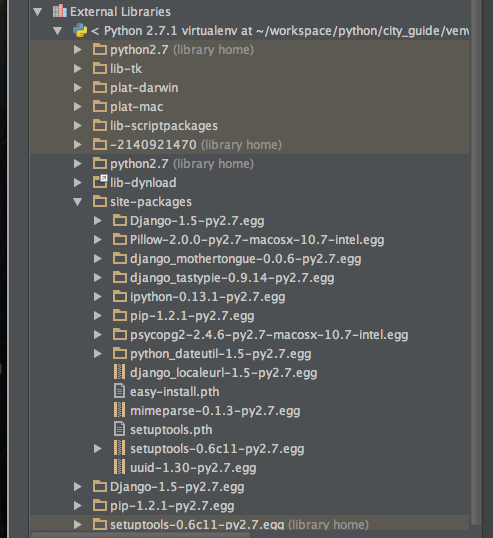 Mark apps, apps_ex, libs as your source roots in PyCharm.